Inconel 718 flat washers are useful in extreme environments that require oxidation and corrosion resistant washers, even when subjected to pressure and heat. Inconel 718, also known as Alloy 718, is twice as strong as Inconel 625. It is incredibly corrosion resistant and used at -423°F to 1300°F. This makes it useful for gas engine turbines and cryogenic tanks. Additionally, due to their nickel-chromium content, Inconel 718 flat washers have excellent resistance even when combating chloride-ion stress-corrosion cracking. The addition of molybdenum to the alloy helps prevent pitting. Inconel 718 has also been precipitation hardened. The heating and quenching process is used to change the alloy’s atomic structure, making it stronger by locking the metal’s grain structure in place. 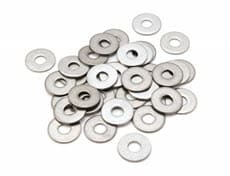 We offer washers to the specific dimensions that you need. Special sizes can be made to order. We offer off-the-shelf sizing ranging from 0.062 to 12 inch inside diameter and thicknesses from 0.002 to ½ inch. Whatever Inconel 718 flat washer you’re looking for, if we don’t have it on our shelf, we can quickly manufacture if for you. Our washer capabilities range from small (under 100 pieces) to large runs. We will custom make your Inconel 718 flat washers to your exact specifications. Contact us today by calling 1-800-736-5014 or filling out our contact form.